Are you travelling to Hungary? 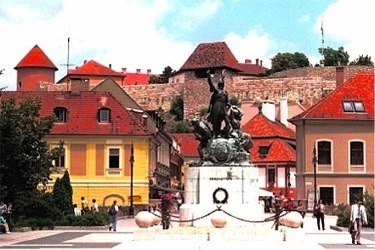 Visit the beautiful city of Eger! Just at a 10 minutes walk from the historical old town you'll find the residential house of "Atrium", which was opened in 1999. It consists of 10 individual and friendly arranged flatlets, each one for 2-6 people. The flatlets are equipped with bathroom or shower and toilet, complete kitchenette (coffeemashine, microwave oven...), balcony or terrace with garden furniture. An extra building for breakfast, a barbecue in the garden and a locked parking area in the court yard will make your rest agreeable. There are also a washing machine, airconditioning (not in every flat) and Internet. Enjoy the hungarian hospitality in the house of "Atrium". More looking-info, please watch our SHOW-VIEW-PICTURES!